Another great SIMNA workshop in WA! 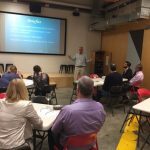 Meeting up with SIMNA members and others for the SIMNA WA event on 15 May, What if: exploring the counterfactual in impact measurement, was all the better for holding it at the Claisebrook Design Community in East Perth, a co-working space encouraging people to Think. Create. Gather. Eat. Networking drinks and sushi helped everyone settle in and find out who was doing what in the WA social outcomes arena. With small and large not-for-profits, government and the private sector represented, like all SIMNA WA events, it was a great mix of people at various phases in their social impact measurement journey. Networking conversations where followed by the more formal part of the evening with a presentation and hands-on activity delivered by Rick Cummings, Emeritus Professor at Murdoch University, Sir Walter Murdoch Graduate School of Public Policy and International Affairs. Rick guided everyone through an introduction to using counterfactuals with evaluation of program outcomes, encouraging conversation, challenges and contemplation about the benefits and use of counterfactuals. Starting off the presentation by pointing out using counterfactuals for social impact evaluation is underpinned by ‘counterfactual thinking’ based in social psychology, Rick clearly explained the logic of the counterfactual; led everyone through a case study to pinpoint the key elements of counterfactual evaluation and then focused everyone’s attention on the benefits and pitfalls. A hands-on activity gave everyone a further insight to using counterfactuals for impact measurement and the evening wound up with more lively conversation, back at the sushi and drinks table. Another great SIMNA WA event successfully completed, thanks to Naysa Basal Teodoro, our volunteer Coordinating Committee member responsible for coordinating the evening … with more to come in July! This year SIMNA WA will present not one, but two events at the UWA Centre for Social Impact, 2018 Social Impact Festival … details coming out soon!